The “Four Ideas” are four paintings on canvas by Edward Aveling Green. They hang below the clerestory on either side of the nave in Eversholt Church. Each idea has a caption painted directly on the wall. They represent Sacrifice, Resurrection, Immortality and Reconciliation. I (EJW) say “Ideas” because I don’t know what to call them. “Four Goals” would not be right because “Sacrifice” is not a goal but a means to an end. Is resurrection a goal? Or is it just a means to the end of immortality? 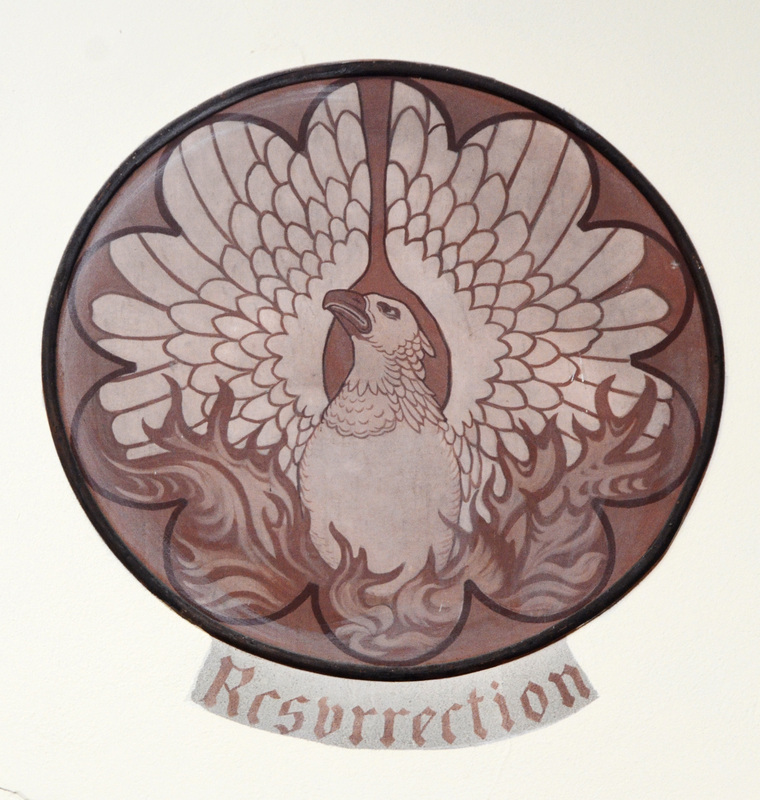 How does a pagan phoenix represent Christian resurrection? I leave these questions to those better versed in religious lore than I. Please leave a comment below if you know any more here. These photos were taken by me, Emrys Williams, in June 2016, using a camera-mounted direct flash. They have been photoshopped to enhance exposure and contrast. 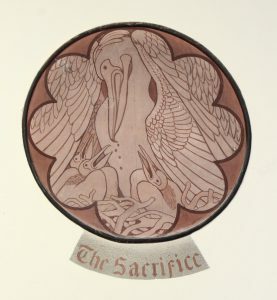 “The Sacrifice”, a pelican supposedly wounding itself to provide for its young, seems to be a post-biblical, mediæval, myth. It was represented in the first edition of the King James Bible. Phoenix, the bird, does not seem to be mentioned in most translations of the bible. This page alleges that Job 29:18 can be translated to mention the Phoenix bird as a symbol for resurrection, but I cannot find any translation online which admits to that. There is some controversy over the issue. 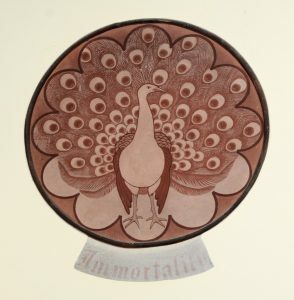 The peacock is alleged to be an early AD symbol of immortality, allegedly [sic] from an earlier legend that peacock flesh does not decay. I couldn’t find any reference earlier than Augustine to this idea. The dove with olive branch is another early Christian (not BC) symbol, of peace. So, all four of these ideas seem to be post-biblical myths. Whether that has any artistic import is for cleverer folk to understand.